The Colosseum is the main amphitheater of the Roman world, it is the largest, and the most symbolic too. Built from 70 AD (possibly 72), it was inaugurated only 10 years later. Very soon, heavy improvements were made, but once finished it was not changed any further. On the other hand, it undergoes throughout its history many restorations or repair works because very regularly it was damaged by fires or earthquakes. Finally, very few degradations were made by the hand of the man, most of the damage came from natural disasters. It is a real feat to find the Colosseum in its current state of preservation when one sees its painful past. Destroyed completely during antiquity it was rebuilt identically at least once, but every 20 years a natural disaster seriously damaged it, and that until the fourteenth century, the time of the great earthquakes that shook the l 'Europe. If we look at a map of the relief of the Roman region, it is contested that it is a fluvial region, the Tiber passes in the middle of a rather flat valley. It is fed regularly by streams that descend from the surrounding hills. At one of the coves, where a small island is, one of the rivers formed a small lake that makes the area swampy. In the seventh century BC the Etruscans came to settle on the banks of the Tiber, on these hills. They built a city that quickly flourished. The first king of Rome, Romulus, had it strengthened. Its successors develop these fortifications, enlarge the city which extends between the Tiber and the lake which was named 'palus Caprae', ie the 'swamp of the goats'. It was probably an area where farmed goats were released. But the increase in the population will force the inhabitants to dry the marsh because it had become too close to the last houses. The city, in the 1st century BC, occupied a terrain that went from the banks of the Tiber to the top of the hills. Comes the reign of Nero (54 to 68 AD). This emperor was known for his cruelty (he had his mother murdered and attacked the first Christians), but also for his megalomania. In July of '64 an immense fire took place which ravaged Rome. This was the starting point for the construction of the Colosseum. In fact, Nero took advantage of the fire to declare a large area of ​​the center of Rome as his property. He had the existing buildings razed there and built a large house, the Domus Aura, a kind of palace that could only be accessed if invited. It was surrounded by large gardens, it had a triumphal arch that served as an entrance and the bottom of the valley in which it was built had a rectangular pond and a portico. In this area, there were also many individual buildings serving as homes for its guests for example. Historians emphasize the luxury of the palace and its surroundings, but also the size of the prohibited area: From 20 to 60 hectares, depending on the people, which makes, even for the low estimate, a sector huge to be in the center of Rome. Of course, doing that Nero set the people back. It suppressed to the people the enjoyment of the city center which was then devolved to the emperor. No wonder then that at his death, his successor Vespasian ordered to give back to the people the domus and its gardens. One of the first decisions as emperor of Rome was to destroy the Domus Aura, its gardens and to build on the site of the rectangular basin the most popular public building that could exist in the Roman Empire: an amphitheater. But not just any: The largest, most beautiful amphitheater in the Empire. And that's what was done. It is in 71 AD that work begins. They lasted 10 years, the Colosseum having been inaugurated in 80 by the son of Vespasian, Titus. If the choice of the site was essentially political, it also had a big advantage: The valley had been drained a long time ago to allow the extension of the city, so there was an important channel which descended it, canalization relatively deeply buried in the soil, which artificially drained the area. Geologically, the place where the Colosseum will be built is a thick layer of compact clay on which a layer of silt is piled up. The Nero basin did not go down to the clay layer, so one of the first things to do was to dry the pond, then to disperse the silt until it reached the clay layer. Once made the clay layer was dug in the form of an oval ring with two shallower notches, at the end of the longest axis of the oval. Attention, the dimensions are impressive: The oval ring foundations is 6m deep and 31m wide, all for a distance of 530m long! And again, that's the hole in the foundations. All around this hole the Romans erected a brick wall 3m wide and 6m high, inside and outside the ring. Then, they filled the ring with layers of alternating Roman concrete with layers of stones to make the foundations themselves: 31m wide and 12m high (6 dug, 6 above), on a run of 530m, it we made ... 200 000m3 of foundation. The interior wall was dug out of niches. They still exist today, they are in the hypogeum. The foundations are pierced with 4 tunnels, in the axes. When at the natural level of the ground, it was reassembled following the construction of the wall of 3m to support the foundations. Large amounts of earth and debris from surrounding buildings served as backfill. On the foundations, a travertine stone floor was laid. 90 cm thick, these stones of local origin were arranged side by side until they covered the whole of the oval designed by the foundations. Travertine stone is common in the region of Rome, it is a hard stone without excess, brown, which is transported without much difficulty. It is also relatively well sized. There are different kinds. 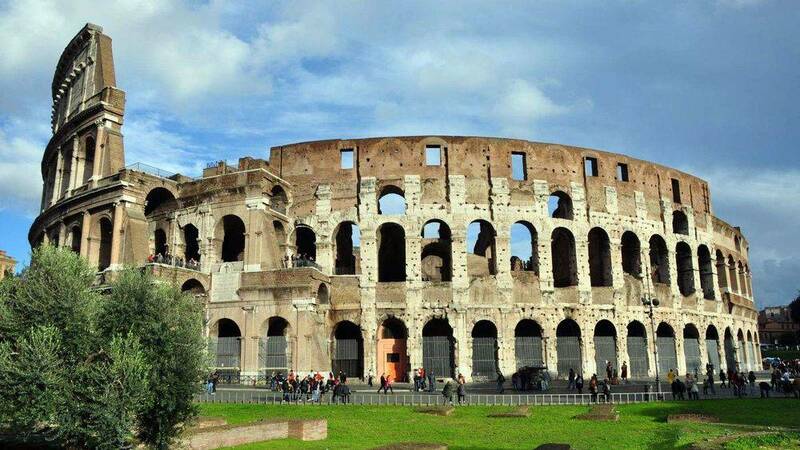 One of them is more resistant to fire, it was not used during the construction and badly took those who made this choice because the Colosseum burned a few decades later, it was then necessary to rebuild it, and this time it is this fire resistant stone that has been used. She is still seen on the spot. once the ground was done, the builders erected stone pillars to the second floor, the highest at the time of construction (the third floor will be built later). The stones of the pillars were adjusted in pairs and ended in a vault. In fact pillars, it was more walls arranged in the form of radius, so along an axis from the center of the arena to the outside of the building, perpendicular to the facade. The walls were welded to the floor. Yes, welded. To do this, the builders pierced the floor with a narrow and deep hole just at the abutment, and pierced the bottom block, the one in contact with the floor, in the same way. Once in place, all that remained was to sink into the melted iron hole. Once hardened, the two blocks were inseparable. Clever. The height of the pillars depended on their positions in relation to the benches they were supposed to support. Thus those near the arena were lower, those close to the facade rose to the second floor. Once the skeleton ended it was necessary to create a series of radiant vault towards the center of the arena, in gradient. It is these vaults that supported the stones used as floor cavea. Or, to have another vision, they served as roof to the complete structure and it is on this roof that the benches were installed for the spectators. The materials used were varied, it is precisely this variety that ensured its solidity to the whole, each type of stone resistant to a different load, they could transmit this load by absorbing a part. If the main pillars are travertine, the radiating walls are brick or tuff, and the Roman concrete vaults. Some pieces are marble, but this material is mainly used for decoration. Many of these stones were re-used, that is, they came from previously destroyed buildings. For the construction we were therefore content to resize the faces in contact with the other stones and the visible face of the outside. The inner side, it was rarely touched, probably to save time. At the time of construction several vaults were only made at the end of construction. They formed openings through which the workmen could mount the loads on wooden platforms. Among the different construction techniques used is the metal clip. To make sure that two contiguous blocks do not move, they are pierced with two holes and an iron clip is attached to them. There was a lot, almost all the blocks. But during the Middle Ages these staples were recovered and melted, so nowadays we can see that the Colosseum is full of holes: These are the locations of these staples. From a practical point of view, the Colosseum worksite took place in several points. While climbing the highest walls the workers of the lowest walls had already begun their work. Some did the floors and laid the benches while others were still casting the vaults of higher points. Several teams worked there, especially since each quarter of the amphitheater was managed independently of the others. If the emperor Vespasian is at the origin of the construction of the Colosseum of Rome, it is his son Titus who will inaugurate it in 80 AD, Vespasian having died meanwhile, in 79. But the Colosseum was not completed at the time of its inauguration, but it was in a complete state corresponding - it seems - to the initial planned plans. The inauguration ceremony was grand, and the festivities lasted a hundred days, which is a record in the matter. During these hundred days the monument hosted various shows, without stopping. Titus did not reign long, he died in 81 and it was his brother Domitian who ascended the throne. Compared to the monument that we know today, that of the inauguration is distinguished by the absence of the 3rd floor and the presence of the hypogeum, ie the entire underground area, under the arena . If the 3rd floor will appear later, the Hypogeum was built just 10 years after the inauguration of the Colosseum. Before, the wooden arena was supported by wooden pillars stuck in the underground, which allowed, by flooding the underground, to raise the water in the arena to make naumachies (Reconstitutions of naval battles). Around 90 AD Domitian did important work by removing the arena and digging the hypogeum. This was the first phase of its construction, it consisted simply in digging a kind of cellar under the arena. Brick pillars were built to support the arena, just above. Later a second phase of work will strengthen the pillars, then, even later, a third phase. Finally it is during a fourth phase of work of the hypogeum that will be built brick walls that exist today. These walls were used to create corridors and rooms for the storage of scenery, for the confinement of wild animals, for the warm-up of gladiators, etc. There were also mechanical systems to mount people or objects in the arena, directly from the basement: Elevators. And yes. Almost as soon as it was built, the Colosseum was repaired. Indeed, although it is essentially stone many elements of its architecture were wood and metal, so subject to fire. But fires are the main disasters that took place in the city during antiquity. For a few hundred years, until about the fifth century, the Colosseum was the subject of several fires but also of earthquakes, provoking regularly either it is repaired or rebuilt. When we talk about rebuilding the Colosseum, we talk about redoing a part of the superstructure, recosntruire the hypogeum (the halls under the arena) and the arena itself, so it was real complex work that could last several dozens of years. This is what happened when it was struck by lightning in 217. It was reopened in 222 but the work was completed in 240 only. Learn more about repairs to the Colosseum. The Colosseum was used until the 6th century as a theater. He was particularly busy, with a show every 2/3 days or so, so the pace was quite high. Under Philippus took place the celebrations of the millennium of Rome, in 248, they were particularly impressive. A large number of exotic animals brought to the arena by his predecessor Gordien were killed in the war against the Persians. During the first centuries the Colosseum was also used to kill Christians, so there is evidence of the deaths of Saints Abdon and Sennen who were murdered there. If the persecution of Christians is a historical fact in ancient Rome, it is a period of history that is not that long thanks to the rapid expansion of the Christian religion in the Roman Empire. From the beginning of the fourth century this religion manages to influence the political decisions of the emperor. Thus the gladiatorial combats, always very popular with the population, were modified to transform them into a spectacle rather than a killing. At that time gladiators could more easily be protected, including by the emperor himself. At the beginning of the fifth century the emperors Theodosius and Gratian, empires of the West and the East, forbade paganism and the pagan rites that ensue from it. Gladiator fights are forbidden, the last will take place in 404. From then on the Colosseum is no longer used as it was until now, it will remain so but it is no longer the center of the leisure activity of the inhabitants but becomes an empty shell in the heart of Rome. During the sack of Rome by the Visigoths, between 408 and 410, the surroundings of the Colosseum will be used as cemeteries, since it was impossible to go outside the city to bury the dead. This vocation will continue until the 6th century, a period during which the Colosseum ceases to be used and actually becomes a cemetery. In parallel during the fifth century the Mediterranean region suffered many earthquakes which damaged the building at regular intervals. However, it was repaired each time as evidenced by the various engraved stones announcing the end of the work. The main one is the lack of money. Indeed, after the separation of the two empires (of East and West) Rome weakens considerably. The Empire no longer has the power of the past or the ability to maintain a stable border or organize security within these borders. The money is running out and the people could not conceive of the continuation of the organization of great popular festivals in Rome as life became more and more difficult in the provinces but also in the city. The second reason is the regular invasion of Italy. Whereas once the Empire was solid, the city was looted twice during the fifth century by the Visigoths and the Vandals. The general state of mind of the Romans was more for the security of their property than for the pleasures of the society in which they lived. Finally you must know that the tastes of the Romans had also changed. They needed other distractions than those of their ancestors, whom they considered to be backward. It is therefore natural that the grandiose spectacles of the Colosseum were abandoned. It was from the fourth century that the Colosseum began to be degraded voluntarily. This may seem surprising since it will serve for a century and has been repaired several times, but the repairs and deliberate damage were not on the same points. Indeed from the fourth century it is the heavy blocks of bolsters that were gradually dismantled to either make building blocks, or reduce them to powder and burn them to make lime. This is how part of the superstructure disappeared. In parallel these high walls were the ideal to protect themselves from intruders. As a result, several houses were built inside the Colosseum, forming a sort of isolated village. It seems that it was a property of a baron of the city, a person important enough to requisition it without being challenged. The neighborhood changed too. During the sieges of the barbarian peoples its surroundings, then its interior hosted a cemetery. In the fifth century the sewers were no longer maintained, the waste began to accumulate. Urbanistically a road was built to link it to the hill Celio. From the 6th century the Roman Empire disappeared. The population of Rome fell, the city became a city without soul, without activity. It focuses on the banks of the Tiber. The Colosseum district disappeared, the monument remaining a little lonely in the landscape. However it was still inhabited, since inside the houses were built and maintained in state until the nineteenth century. It must have been a small isolated and autonomous village. Left in the countryside the earth accumulated in the valley where it had been built, which raised the ground level. It is estimated that this level rose by a meter 30 between the fifth century and the ninth century, then continued to climb up to hide the arches of the ground floor. In the 9th century there were two other earthquakes, but we do not know the damage they may have caused. Finally we find the Colosseum as a property of the Church, it is attached to the church of Santa Maria Nova. There is still today the bill of sale of the building. The church built houses again, forming a new village populated so quickly that new houses were built outside, supported on the facade. At the beginning of the thirteenth century this place had reached great popularity, the road leading to Rome, and therefore to the papal palace, was passing by. In medieval times the Colosseum began to suffer the onslaught of the Normans in 1084. They plundered Rome, which could only recover in the form of several seigniorial families who went to war against each other. Deprived of central power, the population could only protect themselves from anyone carrying weapons. One of these families, the Frangipanes, recovered the Colosseum and made it a stronghold that she shared with the Church, a small population living on the western part of the cavea while the Frangipane family lived on the eastern side. In 1114 the people of Rome revolted and drove out all the seigniorial families of the city. The Colosseum was recovered and declared public property, but it was short-lived since we find the Frangipane family as occupant of the Colosseum as early as 1159. In 1216 the other noble family tries to conquer the Colosseum, the Annibaldi. The conflict lasted until the end of the 1200s, when the Annibaldi managed to scare the Frangipani. Unfortunately for them in 1319 they had to return the Colosseum to the Church. In 1231 and 1349 two important new earthquakes took place. 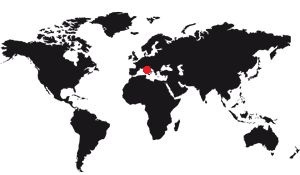 The second is well known in all the regions around the Mediterranean because it was the most serious, the most deadly. Many buildings have collapsed everywhere in Southern Europe and North Africa. The Colosseum lost some arches of the South side facade, damage that was added to those suffered by the amphitheater in 1231 and which had seen collapse of the first arches, to the Northeast. As a result, the Colosseum was surrounded by fallen, unused stones. Of course at the time such stones were envied because they allowed the construction of buildings to mondre fresh. The church, the owner of the building, allowed two Roman families to sell the stones, but obviously it was not a commercial success. The fact remains that the Colosseum was cleared of these cumbersome stones during the 14th and 15th centuries. The 14th century is also marked by the move of the papal palace to Avignon, France. As a result Rome again suffered a depopulation, which reached the floor figure of 17,000 inhabitants. The region was no longer secure and the Colosseum became the haunt of bandits. In 1377 the pope returns to Rome. An order of Roman citizens was entrusted with the task of cleaning up the Colosseum area and the Colosseum itself, a task which it carried out successfully. Suddenly the building was divided into three: One third for this order citizen, the religious association Arciconfraternita del SS. Salvatore ad Sancta Sanctorum, a third to the financier of the Church and a third to the Roman Senate, who had been reconstituted on the foundations of the ancient Senate. The archconfraternity thus obtained a third of the building, but he also gained the right of sale of the stones. But in the fifteenth century Rome was to be rebuilt, and its stones made the wealth of this archconfraternity. It kept this right for centuries since we find in the documentation their report dated 1606. Moreover over time we went from the right to reuse the fallen stones on the ground to that of destroyed the facade to sell his stones a to one. This is the origin of the demolition of the facade of the Colosseum.. The fifteenth century is also the first century of awareness of the historical and archaeological interest of the Colosseum. Belonging partly to the Church, the building is recognized as having been the martyrdom of the first Christians. The Santissimo Salvatore ad ad Sancta Sanctorum organizes religious shows reminiscent of the passion of Christ, performances that are very successful. During this time the first archaeological excavations are made, but of course they remain not only superficial, but especially they are not made with the same attentions as what will be done during the twentieth century. At the end of the sixteenth century Pope Sixtus asked that the Colosseum be converted into an industrial site, a spinning factory to be created. Unfortunately his death prevented this project from existing, but plans had already been made. It was also at this time that important changes were made to the Santa Maria della Pieta Chapel, which was still in the center of the arena. It was enlarged by the addition of the house of a guardian, the building of the chapel itself was renovated. 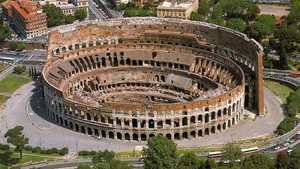 Then came the seventeenth century, which was rather fatal for the Colosseum since it was again delivered to looters, thieves and robbers of all kinds. Once again damaged, it was not regained religiously until 1700, when Pope Clement XI turned the building into a warehouse for the production of powder from a nearby factory. He took the opportunity to install a large cross in the arena. The Way of the Cross of the Colosseum is a creation of this pope, in 1720. In 1743 the building is again restored, and there are even some arches that are rebuilt for the occasion. But it was in 1749 that was made the greatest decision for the safeguarding of the Colosseum: It is Benoit XIV which declares the building "public church" and makes prohibit the recovery of its stones. This act prevented him from being further demolished, which would have inexorably led to his disappearance. At the end of the eighteenth century Napoleon I invaded Italy. He conquers Rome despite the opposition of the pontifical troops and exiles the pope. Master of the city, he made him make plans for modernization that proposes the creation of a major archaeological center encompassing the center of Rome and whose Colosseum would have been part, but this plan was never implemented. At that time the Colosseum was still a warehouse for a cannon-rotting factory, and the building was in a very bad state, the consequences of decades during which it was not maintained. However, the French decided to take over the Colosseum and organized the removal of the stored material as well as the reinforcement of the arcades that threatened to collapse. It was also at the beginning of the 19th century that the first precise shots of the monument were drawn. It must be said that many excavations were executed at this time, excavations made in order to study the monument in a precise way to consolidate without the risk of collapsing. Several restoration projects were launched, but none were really satisfactory, which did not prevent the necessary reinforcement work. It is also from this time that dates the brick wall that ends the stone facade, the famous brick wall that astonishes visitors today. Throughout the 19th century the Colosseum was regularly repaired, rebuilt and renovated. The ground is dug to regain its initial level, the arches are cleared, strengthened. The hypogeum is restored to its ancient form. Workers (or prisoners, because some work was done by convicts) regularly discover new walls, niches, podiums, remains of statues, etc. All these new discoveries involve new studies, new restorations. The arena was cleared towards the end of the century, at about the same time as the final removal of the Stations of the Cross, an act that triggered the Church's ire, of course. At the beginning of the 20th century, some of the stands were rebuilt, and it was adapted for the reception of crowds.